The Train of Thought: Those Ungrateful Iraqis! There's really a lot to take from these tweets that Charles Davis found. 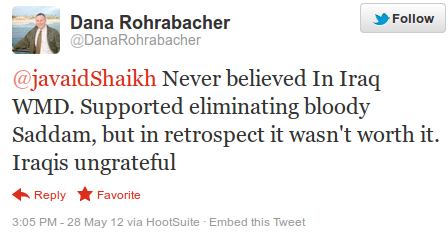 The "Iraqis ungrateful" part of that tweet is some of the best neo-colonial rhetoric we've heard in a while. After all we've done for them, with destroying their country, the killing of upwards of 100,000 civilians and displacing several million others... how dare they! Never believed in Iraq WMD? Uhhhhhh, that might have been useful to know, oh I don't know, sometime fall 2002-spring 2003? People might have wanted to know that you were voting to go to war based on your desire to kill Saddam, rather than what the world was hearing as the actual justifications. On the other hand, this is a vocal supporter of the Iraq war admitting he was wrong, even if it is for stupid, racist reasons. If it means we have to deal with more mindless neo-colonial rhetoric rather than giant wars that kill lots of people, I'll take that trade!